The India International Center invites all concerned citizens to a talk on “Wetlands Ecology and the Yamuna Biodiversity Park”, as the fourth lecture in the series on ‘Water: the stuff of life”. The talk will be delivered by Professor C.R. Babu, Emeritus Professor, Center for Environmental Management of Degraded Ecosystems (CEMDE), University of Delhi, and Project Incharge, Yamuna Biodiversity Park. The session will be chaired by Prof. Ramakrishna Ramaswamy of the School of Physical Sciences, Jawaharlal Nerhu University. 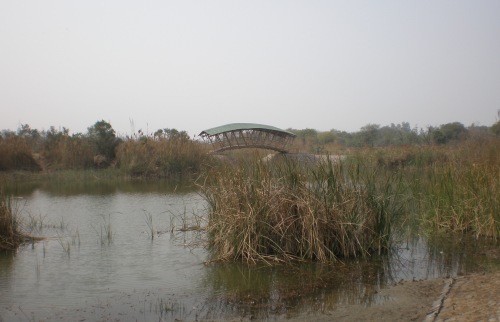 The Yamuna Biodiversity Park has been an innovative project, an open laboratory for the students of environmental and biological studies, to observe, experiment, learn and teach! A joint project of the University of Delhi (DU) and the Delhi Development Authority (DDA), the concept of the Park was first started in 2001, on almost a barren piece of land with only a fruit orchard nearby. Today, it supports a large diversity of flora and fauna and receives a considerable number of migratory birds every winter. The landscape division of Delhi Development Authority NEW DELHI, INDIA, Biodiversity foundation of India and Delhi University had chosen bamboo as the chief building material for all the structures in the prestigious project -Yamuna Biodiversity Park. During the tenure of President Dr.A.P.J.Abdul Kalam, this bridge was proposed as a prototype capable of being constructed to connect the villages of North-East India to the National Main stream. Economical & Sustainable bridges can be made from bamboo in a place of steel bridges to solve the connectivity problem of the villages.